Though I love green colour, I can hardly say the same when it comes to eating greens. I know I really should not be saying such things openly now, now that my kids can hold it against me! Anyway though I don’t like the idea of eating greens, when I prepare them, I enjoy it much. It’s like you need some reasons not to like something right! 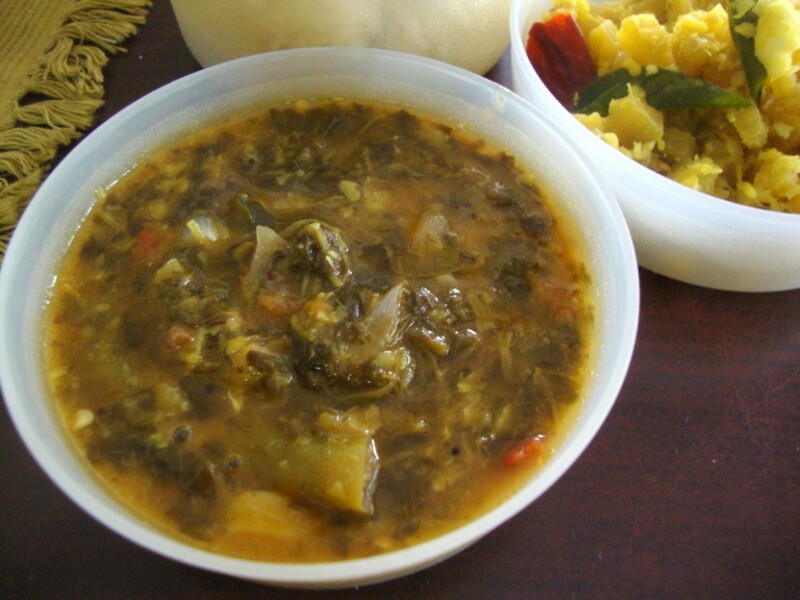 This being the reason it’s not often that I willing make a dal with greens or stir fry, but believe me I make greens at least once a week. We regularly make the greens in the traditional andhra pappu style. I have seen my tamilian friends bringing this masiyal and always wanted to make it. So this time I thought I will prepare the greens with dal in Tamilian style. While making the dal I remembered Amma making the regular dals in this style, meaning cooking the dals directly in the pan of rolling water and then making a mashed dal. These days with the comfort of pressure cooker, one can’t imagine cooking it directly, though the taste will surely be so much better. I packed this for my lunch and trust me, it was so yum! This method is called masiyal, which means you churn the dal using a dal churner or masher. 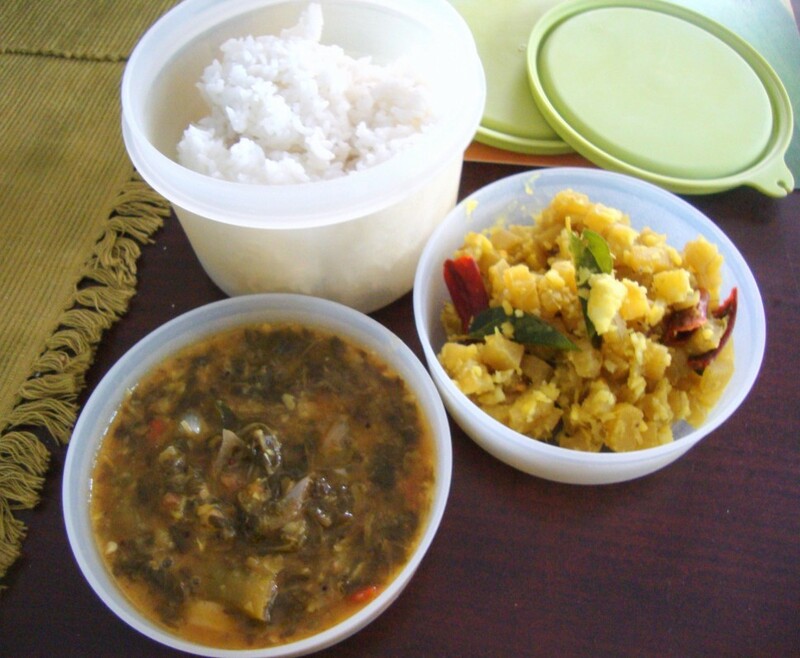 The other method of making this is the simple Keerai Masiyal, where the dal/pappu is not added. Wash and pressure cook the toor dal with a dash of hing, turmeric powder and oil. Pressure cook for 3 whistles till the dal is well cooked. Once the pressure falls, churn it well adding little water. Keep it aside. Pick the greens well and wash about 3 – 4 times in water to make sure the dirt is removed. Let it drain for couple of mins. Chop the leaves if required. Then take the greens in a hollow pan, along with finely chopped tomatoes, green chilies, salt. Cover and cook on high flame. There is no need to add more water than couple of tbsp of water. The greens will start to let out more water and simmer after 5 – 7 mins. Once the greens are cooked, switch off and allow it to cool a bit. Then holding the vessel, remove the green chilis if you want, churn well using the churner. Once the greens are churned and reache a semi smooth paste, put it back on the flame, add the cooked dal, 1 cup of water. Bring to boil. In another pan, heat oil. When the oil is hot, add mustard, urad, cumin seeds, dry red chillies, curry leaves. When the mustard pops, add the onions and saute till the onions turn brown. At this stage, add this tempering to the boiling dal. Cover immediately with lid and switch off the flame. Serve with steaming rice and vegetable. Paruppu Masiyal is soo comforting !! Healthy and comforting bowl of dal..would love to have with some steaming rice. Keerai sambar is something which I do 2 to 3 times a month .. looks yummy. I would love to have this with hot rice and ghee and some appalam on the side. Looks very inviting! Comforting masiyal,never said no to them..
i love keerai!!! i normally cook them in Moong!!! Must try with toor-dal and tamarind!!!! Looks delicious and craving for keerai. Both the dishes look yummy.